If cricket is your game then you are in for a treat this January and February. The Indian cricket team who have arrived for a two month tour of South Africa are playing the Proteas in three Test matches, six One Day Internationals and three T20 matches during the tour. Several of these bumper matches take place at the Bidvest Wanderers Stadium. The Stadium is under 10 minutes from Liz at Lancaster in Corlett Drive in Illovo, just south of Sandton. The current stadium, with a seating capacity of 34,000, was built in 1956 to replace the old Wanderers Stadium. Stay at our well located Guest House and watch cricket 10 minutes away from our establishment. View our Craighall Guest House for Rates and Availability! The first Wanderers stadium, one the earliest and most famous sports clubs in Johannesburg, was located in Johannesburg Central on a piece of land leased in 1888 from President Paul Kruger. 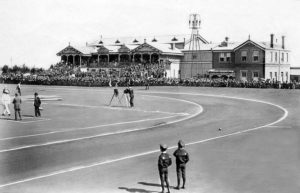 Situated near the current railway station, Wanderers hosted its first cricket test match on 2 March 1896 when South Africa played England. It went on to host 22 test matches until it moved to Illovo in 1939. In 1936 the Wanderers’ Club had purchased 200 acres in Illovo and established a golf course. And when the Government expropriated the old Wanderers’ complex in order to accommodate the extension of the Johannesburg Station, they moved the cricket ground as well. On South Africa’s re-admission to international cricket in 1991 (having been boycotted for 2 decades),the Stadium was completely overhauled. In 1996 five new 65 metre high flood light masts enabled day-night limited-overs cricket. It seems this added to its intimating atmosphere giving it the nickname ‘The Bullring’. The ground is among the most historically significant cricket grounds of the 21st century. It has staged some of the most important matches in ODI and T20 International history, and has witnessed a number of outstanding world records. In 1995 English batsman Mike Atherton batted for 10 hours to secure England a famous draw in the second Test of the series. He scored 185 not out. The innings lasted an astonishing 643 minute during which he faced 492 balls. 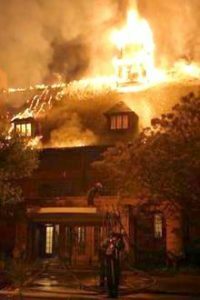 In September 2004 the clubhouse itself was entirely gutted by a fire, which began in the kitchens and spread through the ventilation ducts destroying trophies, photographs and memorabilia. 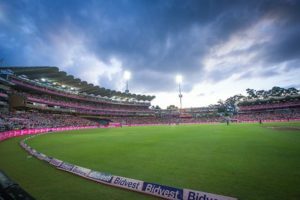 You can book a tour of the Wanderers stadium: lions@cricket.co.za. Oops First T20 century ever was scored … not hit!